Saying they will not tolerate such behavior, Chelsea Schools and Chelsea Police are working with State authorities in offering a $5,000 reward for information leading to the successful prosecution of someone who made a hoax bomb threat on Chelsea High School last Thursday, Jan. 14. The incident started on Thursday afternoon when officials were made aware of a possible bomb threat letter left unattended in an undisclosed location inside Chelsea High. The threat indicated that the bombing would take place on Friday during regular school hours. Though officials said they were skeptical of the letter, they had to take it seriously. So, a full contingent of bomb searching teams were called up. That included the Chelsea Police, the State Police Bomb Squad, and K-9 units from local surrounding departments. On Thursday night, from 9-11 p.m., the entire building and the entire surrounding areas were combed for evidence of an explosive device. In the end, there was nothing found. There was a strong police presence at school on Friday, but officials did choose to go forward with the school day. “Initiating a Bomb Threat – real or a hoax – is a felony in Massachusetts punishable by incarceration in State Prison, and we will prosecute those responsible directly or indirectly to the fullest extent of the law,” said Bourque. If any individual believes he or she may possess any information that may lead to identifying those responsible for this violation of the law they may call the Chelsea Police at (617) 466-4855, or they may also call the anonymous “Crime Stoppers” Tip Line at (617) 466-4880. Police Chief Brian Kyes said this week that he considers the officer that shot an armed suspect to have conducted himself in a heroic fashion early Sunday morning, but that in today’s new world surrounding officer-involved shootings, he has moved to be utterly transparent and investigate the shooting both inside the department and outside the department. The suspect, who had opened fire on a car around 12:30 a.m. Sunday on Broadway, is still being held under 24-hour police guard at Mass General Hospital to treat one bullet wound to the lower chest area. The man charged is Igor Peulic, 32, of Chelsea. Kyes said he is being treated for his wounds, but would be arraigned on several firearms charges once he is medically cleared. According to Kyes, as the bars were emptying out around 12:30 a.m. on Sunday morning, the suspect and a friend came from the direction of Tu Casa Restaurant. It is still uncertain if the two were in that establishment, but it is possible that they were there. At the same time, a motor vehicle drove down Broadway and turned at 4th Street. According to video evidence, the friend crossed the street to the vicinity of the Chelsea Walk Pub. The suspect appeared to have something in his hand, and then dropped it in the street. As he picked it up, police said that they observed his hand raise up and fire three rounds. Kyes said they aren’t sure who the shots were meant for, whether it was the turning motor vehicle or a parked car that fled the scene. “It’s unclear with any degree of certainty whether he was shooting up Broadway to the car at 4th Street,” said the chief. What is certain is that two police cruisers stationed in Bellingham Square immediately heard the gunshots and rushed to the scene. Police exited their cruisers and located the suspect fleeing down the Chelsea Walk. One officer was hot on the trail, just about 10 paces behind the suspect, observing him carrying a firearm that Kyes described as a “canon.” The suspect held the .357 revolver in his right hand as he ran up Cherry Street and to 5th Street. Simultaneously, an officer stationed in the parking lot of City Hall heard the radio calls and deduced that the suspect would soon be heading up Chestnut Street towards City Hall. The officer then drove his cruiser halfway down Chestnut Street, parked it and – lo and behold – observed the suspect running up the street right towards him. Kyes said the officer – who wishes to remain anonymous to protect himself and is now on paid administrative leave – exited the cruiser and drew his firearm. Kyes said officers really have no choice when a gun is raised in their direction, and he said he was proud the officer shot to disarm rather than to kill. Kyes said the situation occurs at a time when police-involved shooting are at an all-time high for public and professional scrutiny. He said his department wants to prove to the public, and everyone else, that they have acted above reproach and train never to shoot unless absolutely necessary. In addition to the DA’s investigation, an examination of this event is also being conducted by the Chelsea Police Department’s Professional Standards Division – Critical Incident Review Team. This review will focus on existing policy, tactics, and training as they relate to the use of force in this situation. Kyes said there was no timeline for the investigation, and it could take anywhere from a few weeks to a month. Anyone with any information regarding this incident – or any other in the City of Chelsea – is reminded and strongly encouraged to provide it to the Suffolk County State Police Detective Unit at 617-727-8817 or Chelsea Police Department by calling the 24-hour CrimeStoppers tip line at 617-466-4880. Callers may remain anonymous if they wish. Tips can also be submitted through the Chelsea Police Department’s website at www.chelseapolice.com. The Chelsea Police Department MYPD app is also available for Smartphone applications such as Apple and Android. Chelsea Police are following several leads and interviewing witnesses regarding a brazen and brutal stabbing on Blossom Street Monday afternoon by multiple attackers. Capt. Keith Houghton said the 14-year-old is a student at Chelsea High School (CHS), but was not at school on the day of the attack. Supt. Mary Bourque confirmed that the student was absent and the school – though nearby – was never part of the attack and was never in any jeopardy. She did confirm he was a student there, but could not give his name. Police said around 1:40 p.m. the young man was stabbed multiple times by at least three people – one of whom was on a bike. Witnesses at the scene said they had observed the attack and saw the three alleged perpetrators flee up Carmel Street. Those witnesses then found the young man lying in the street and gravely injured. They alerted police, who responded and had the young man transported to Mass General. He was in serious condition at first, but is now in stable condition. Houghton said one of the first things police did when they found out the age of the youth was to check CHS and make sure the incident hadn’t started there or filtered into there. It was quickly confirmed, he said, that all was quiet at the school and that the young man had not reported to school on Monday. Unconfirmed reports on the street were that the young man – after having been stabbed – was crawling up Addison and Blossom Street and pleading for help, calling out that his attackers were going to kill him. Those cries for help, perhaps, are what alerted several nearby witnesses to the brazen daylight attack and sent the perpetrators fleeing. 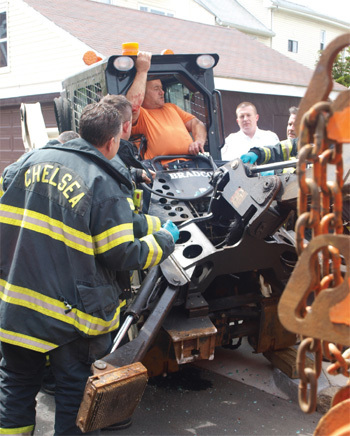 Firefighters rescued a DPW worker that became trapped in a piece of City construction equipment on Orange Street last Thursday, May 22, when the equipment compressed inward – crushing the man at the waist and causing him extreme pain. Around 10:46 a.m., Engine 2 and Tower 1 were dispatched to Orange Street for the report of a DPW worker trapped inside a piece of construction equipment. Units arrived and found the worker trapped inside a piece of equipment called a Skid-Steer, which is similar to a backhoe. The front of the Skid-Steer had compressed inward, crushing the worker at his waist and lower extremities. Firefighters evaluated the worker who was conscious and alert but in extreme pain. Crews worked to free the man using equipment such as rescue air bags and hydraulic rams, which are both designed to lift heavy objects. However, neither piece of equipment would fit in the small space necessary to free the worker. Under the direction of Capt. Michael Masucci, the firefighters deployed a new piece of equipment recently purchased by the department called a Grip Hoist. The firefighters used a nearby dump truck as an anchor point for the hoist and secured the other end to the crushed Skid-Steer. Within minutes the worker was extricated from the vehicle and transported to the MGH in Boston. The federal Occupational Safety and Health Administration (OSHA) is investigating the accident. honor of the fallen Boston Fire Fighters from last Wednesday’s 9-alarm fire in the Back Bay. last Wednesday evening, March 26. The tragic 9-alarm fatal fire in Boston last Wednesday has Chelsea firefighters reflecting on their own procedures and preparing to attend the funerals for both fallen Boston jakes. Earlier this week, department shift commanders took the time to speak to fire crews about the Boston fire. In addition to going over the incident internally, they also reviewed their own ‘mayday’ procedures. “The firefighters are having a difficult time with this fire where it appeared to be a routine job that suddenly turned tragic,” said Dep. Chief John Quatieri. Meanwhile, Chelsea Fire plans to send more than 50 members and an honor guard to each of the two funerals. A limo company in Medford was kind enough to donate a bus, Quatieri said. 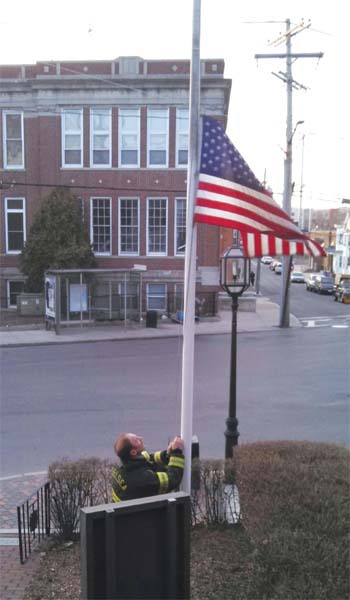 “Joseph’s Limousine in Medford was kind enough to donate a bus to the department, each day, to transport our personnel to the funerals,” said Quatieri.